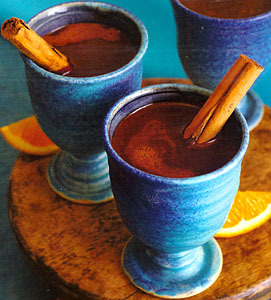 Recipe for Mayan Hot Chocolate with Chile and Orange. This recipe combines chocolate, chile, and orange to create a flavorful hot cocoa with a piquant chile bite. Melt the chocolate in a 4 cup glass measuring cup in a microwave for 90 seconds at 70 percent power. Combine the cocoa powder, sugar, chiles, and cinnamon in a small bowl. Blend together until thoroughly combined and lump free. Add the cream and stir well to make a thick paste. Add the paste to the melted chocolate and mix well, then add the water and stir until thoroughly combined. Heat in the microwave for 90 seconds at 70 percent power, stirring once after 45 seconds. Serve in two Mexican pottery mugs. Squeeze 1 orange wedge into each, divide the hot chocolate evenly between the mugs, and stir well. Garnish with the remaining orange wedges and the cinnamon sticks.